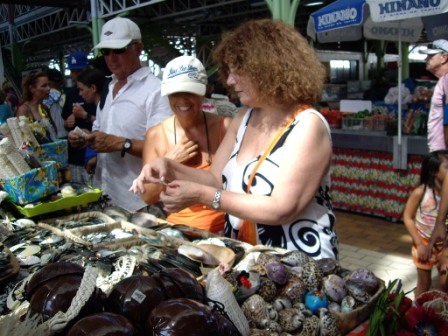 As the capital of French Polynesia, Papeete is a city full of energy. It is a 'mandatory' stopover for all cruisers. This is the place to top up your provisions, fix boat problems, receive family and friends, stop and think what's next. Most of us have it all planned up to Tahiti, and have not a clue where to next. A world of options open, you want to visit all but you need to make options, here you get the feeling that time starts running out. After arriving at midnight the previous night, we were fast asleep early morning when we were waked up by the security guard in the city docks. We could get a proper place in the docks or we could just leave, no charge for the night stay. We were grateful that they let us sleep there but it wasn't the place for us to stay. Too noisy and crowded, just off the town centre. There are several anchorages and marinas and most of our friends where at anchor or in a mooring off Marina Taina so we decided to go there. 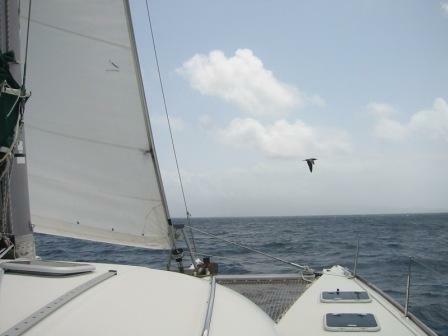 It is a nice sail down between the coast and a large reef and we could see how wise was not to try that during the night. Along the way you have to ask permission from the port authority and may need to wait while a plane departs or lands as your mast may get in the way. The anchorage was crowded, no free moorings, but with so many friends around, VHF radio was busy with welcome messages and soon Songline was calling to show us a spot behind them. This was the first time we met them since we crewed with them in the Panama Canal transit and were happy to see them again. Soon after we anchored we have the pleasure to finally meet Taffy and Shirley from The R.O.A.D. (The Royal Order of Ancient Druids), they were one of the boats a day behind us in the Galapagos-Marquesas passage and had not crossed with them until now. The following days were busy with lots of errands, lots of socializing and preparing to receive Liliana and Eduardo, our friends from Argentina who were coming to stay with us for a couple of weeks. 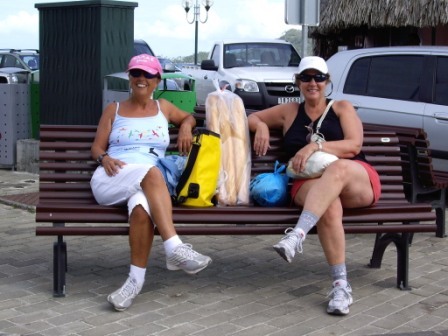 This was the second time they visited, first time was in St Martin, Caribbean and we were looking forward to another great time with them. Every weekend, locals enjoy the sandy spot in the reef, with music, food and lots to drink. Several of us join the fun in our dinghies, we bring drinks, finger food and set up a floating table. Music is loud from the floating bar. A fun afternoon. 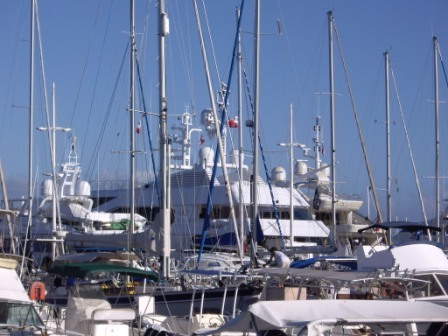 We decided to spend several days at Taina marina, with enough energy to charge batteries, water to do all the washing, fill up water tanks and with good facilities to receive our friends. They will arrive in Papeete on the 18 of July and will sail with us to Bora Bora, stoping along the way in several islands. Liliana and Eduardo are finally here, we spend a couple of days visiting Papeete and the surrounding places. We are all looking forward to our next couple of weeks. After re-fuelling we leave the marina and Papeete and decide to stop at Point Venus, it is a nice anchorage for a quiet overnight in Tahiti, before leaving the following morning to our next destination, Moorea about 20 miles across Papeete. Before heading to the popular Opunohu bay we decide to visit Haapiti, this is a beautiful and isolated stop with just a few boats at anchor. You just need to be careful and not get caught in the lagoon if southerly swells build up. The pass may become dangerous and you might get stranded for several days. 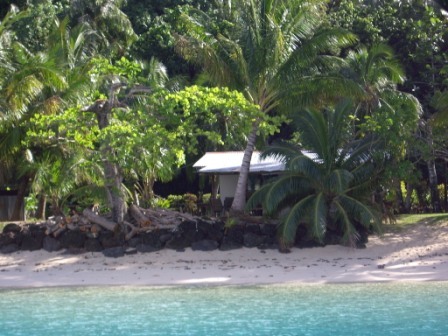 Next day we leave Haapiti and arrive at Opunohu Bay anchorage early afternoon, it is beautiful although crowed. We hire a car and drive around Moorea, visit some beautiful places, including an interesting pineapple plantation. Another day we go on a dinghy expedition to the western corner of the island where there are a couple of motus and an area where you can snorkel with sting rays and sharks. The sting rays come right up to you, attempting to slide up on you in search for food. The sharks are a bit shy and stay further away. The secret is to get there outside the tour operators hours and take a bit of smelly fish with you. Oscar, Liliana and Eduardo, the rays know who has fish in his hands! We keep going a bit farther away from where the rays are in search for the Moorea Club Med. We had spent a fantastic 2 weeks vacation there many years ago and were keen to visit and have lunch there. To our surprise the place is completely run down, the Club Med long gone. We feel sad to see such a beautiful spot in such a dreadful state. While we are in the beach a nasty wind starts to build up and we decide to go back, it is a long way back, with 4 of us in the dinghy and the wind against us, it's a wet and cold ride. We are happy to be back in Zenitude. Even though the weather seems to be changing, not a good sign. The next couple of days the anchorage becomes uncomfortable with swells from the increased wind. There is protected area well inside the bay. It is not nice for swimming and snorkeling but we decide to go there. It is deep but possible to find a spot towards the end of the bay, quiet and very protected. We left Moorea late in the afternoon for a night sail to Huahine, 92 miles away. This was the first night passage for our new crew members and we were a bit concerned with them but they did great and in the morning we arrived to this beautiful island where the abundance of green tropical foliage and wild jungle-like scenery mix with the turquoise water colours. Huahine itself is actually 2 islands known as Huahine-Nui and Huahine-Iti (Big Huahine and little Huahine). We entered the pass and crossed all the way down the canal to the south island and found several beautiful quiet anchorages. The guide was not very clear on where to anchor but we found a good spot at 16.48.52 150.59.67 and later moved to the next bay, Baie D'Avea, a very nice and secluded anchorage. Next day we sail up to Fare, where is possible to buy some fresh food and bread. We met there with The Road during happy hour at the local pub. We joined them of course, impossible to miss a happy hour opportunity with Taffy. Next day we left beautiful Huahine behind and sailed towards famous Bora Bora. We arrived in Bora Bora early afternoon and found the mooring area at the Yacht Club crowed with all moorings taken and the places to anchor too deep for comfort (25 meters). To the starboard side of the entrance channel there is a small motu and we found a nice anchorage there. It is nice and beautiful although a long wet dinghy ride to town. 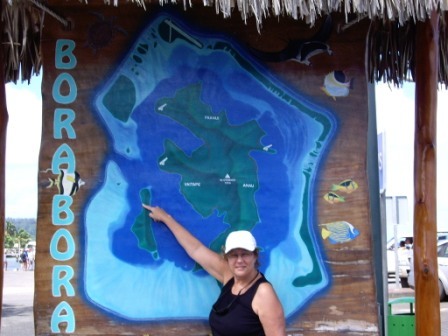 We were expecting Bora Bora to be a perfect end of our friends’ trip but it was not to be. A nasty wind blew all the time until the time they left. They tried snorkelling but it was cold and windy, not enjoyable at all, trips to town where wet. Oscar hurt his wrist and spent a day between doctors and x-rays, finally they told him his wrist was broken and he needed treatment in Raiatea. Eduardo had several terrible tooth pain crises and was leaving on pain killers. Bora Bora was the dream destination for them but I guess they will need to go back and hope for better luck next time. We sadly said good bye to them. We hope they will visit us again, maybe in Australia. 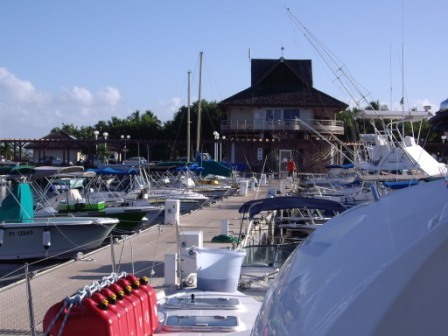 Raiatea is a centre for boating services, with 3 marinas, 2 full service boatyards. There is an airport and a hospital. We arrived early afternoon and found a space at the town docks in Uturoa, which is very close to the hospital and several supermarkets. As soon as we secured Zenitude at the docks Oscar went to the hospital to treat his wrist. As it happened, his wrist was well, not broken, just an old injury that had resented with an effort. In the meantime I found out we could stay at the city docks for free for 3 days, and that is what we did while we visited supermarkets and provisioned. This was going to be our best provisioning place until Fiji. In contrast to busy Raiatea there is laid back beautiful Tahaa. Both islands are enclosed in the same coral reef. We left the docks and went up to a place in Tahaa called the Coral Gradens. It is a beautiful place for snorkelling, the type I like, aquarium style. Oscar was after big fish for dinner and found some good promising places as well for spear fishing. After a peaceful night there we moved to a mooring in the Taravana Yacht Club. It is a very nice place. Richard is an ex-cruiser that has now a restaurant and maintains the moorings that you can use in exchange for spending money in the restaurant. The food is good and there is also a buffet dinner on Tuesdays. Finally the time came to go back to Bora Bora, enjoy the island a bit and get ready for a weather window for our next leg. 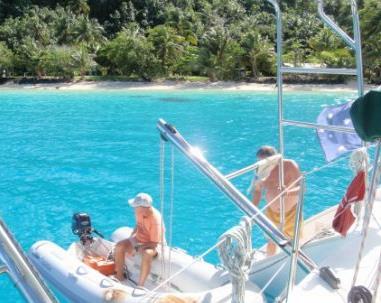 We are back in Bora Bora and this time we pick up a mooring at the Yacht Club. The weather is quite all right now and we go around the island twice. The first time we go around the lagoon in the dinghy. Ze and Sandra join us in their dinghy. We stop at the place where lots of manta rays are swimming and had a beautiful snorkeling, however the current was really strong and I got into trouble, I just couldn't go back to the dinghy. It is an awful feeling when you are trying to go with all you have but you keep seeing the same rocks down the bottom, a sure sign that you are always in the same spot. Luckily, Oscar, who is always checking for currents and stayed next to the dinghy, came to the rescue. There are many fishes as well and they come to feed on some crackers we offer. We keep going and find some fantastic beaches and beautiful resorts along the way. Finally we round the southern tip of the island and shortly we are back to Zenitude. The second time we go around the island on a bike. To my surprise I accept Oscar's offer to do a bike tour, it is not for the exercise, we rent an electric bike, so it is just for the fun. It was a bit scary for me at times, when there was traffic on the road but it was fun, we stop at many places, and enjoyed the day. We could have done it in a car, but surely this was a lot more adventurous. By now we are ready to keep going to our next destination and we need to make a painful decision, where will we go? Should we go to Palmerston and miss out Suwarrow or will it be the other way around? We have some excellent reports from other cruisers about a fantastic time in Suwarrow, so we finally decide that is where we are going.